The Fashion Art Fusion Season 3 is set to take place at the Prestigious Oriental Hotel, Lekki, Lagos State on the 27th of November 2016. This event expresses African art and culture by exhibiting fashion styles created by top and upcoming fashion designers. Also on display on the runway are alternative music, spoken word and dance. We have the attendance of some top designer’s e.g Mai Atafo, Ayo Van Elma, Ejiro Amos Tafiri, Luzol Tailors and Many More. Exhibition of ‘Made in Nigeria’ items begins at 12 noon and the Runway show kicks off by 5pm. 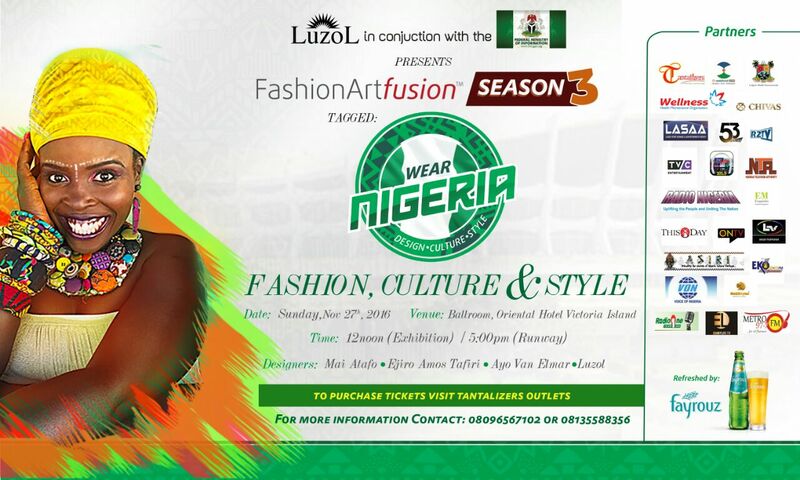 The Fashion Art ‘Fusion Season 3’ is brought to you by Luzol in conjunction with the Federal Ministry of Information and Culture and refreshed with Fayrouz. Visit www.fashionartfusion.com.ng or join the conversation on Instagram; ‘fashionartfus’, Facebook; ‘fashion art fusion’ and Twitter; ‘fashionartfus’.